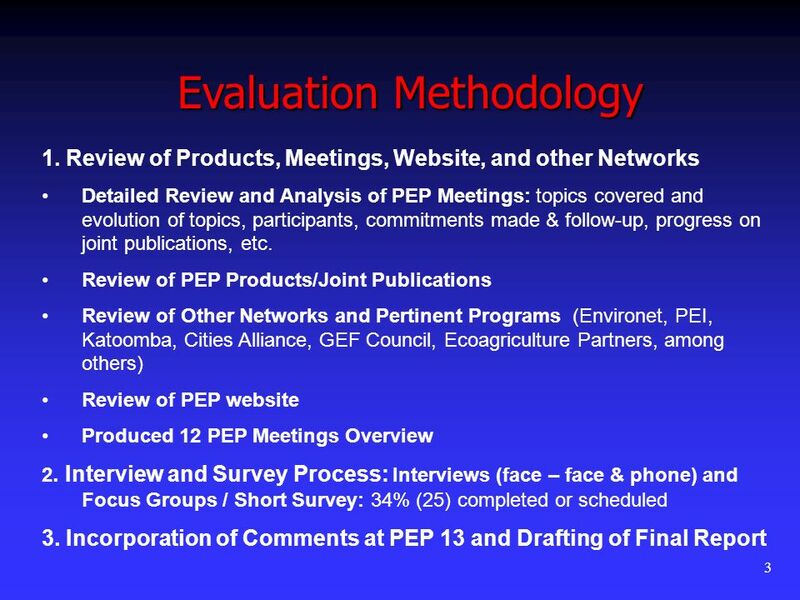 1 Poverty Environment Partnership (PEP) Independent Evaluation Preliminary Results Manila, June 2008 SusDev Tech, LLC Dr. Kenneth Green, President Dianna. 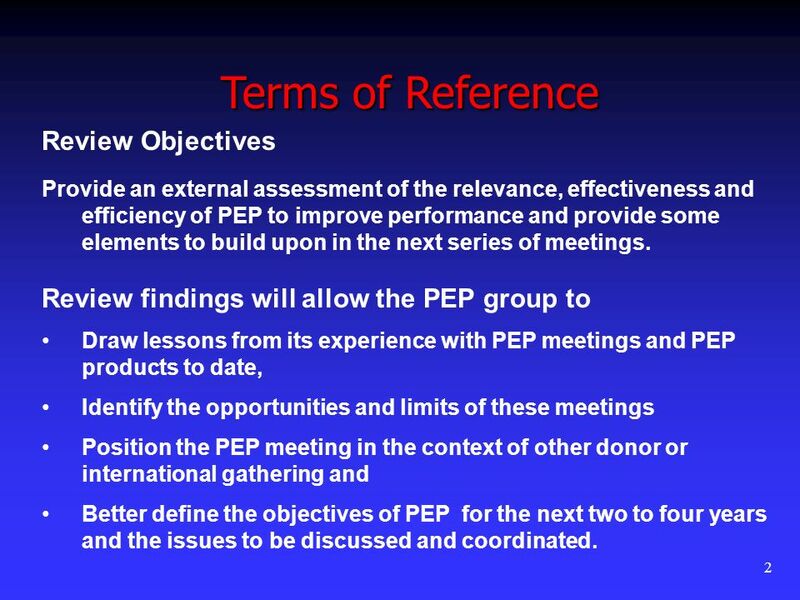 2 2 Terms of Reference Review Objectives Provide an external assessment of the relevance, effectiveness and efficiency of PEP to improve performance and provide some elements to build upon in the next series of meetings. 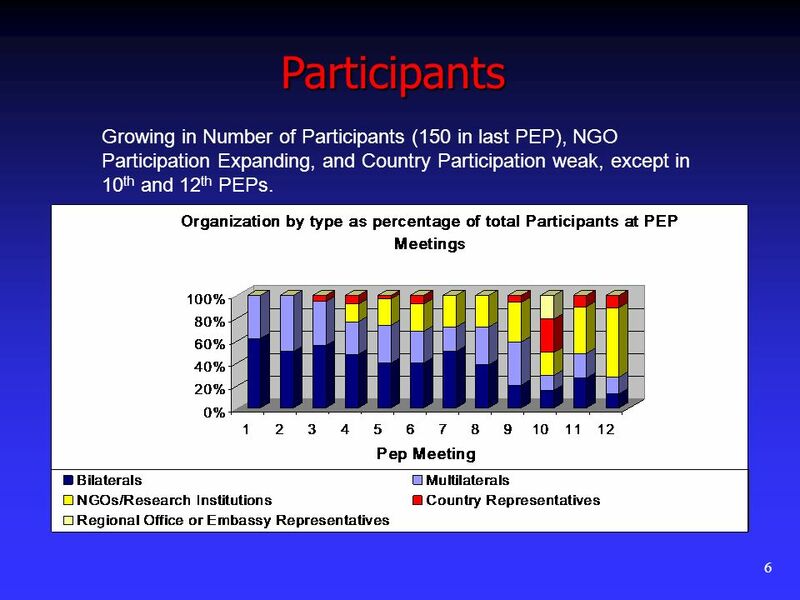 Review findings will allow the PEP group to Draw lessons from its experience with PEP meetings and PEP products to date, Identify the opportunities and limits of these meetings Position the PEP meeting in the context of other donor or international gathering and Better define the objectives of PEP for the next two to four years and the issues to be discussed and coordinated. 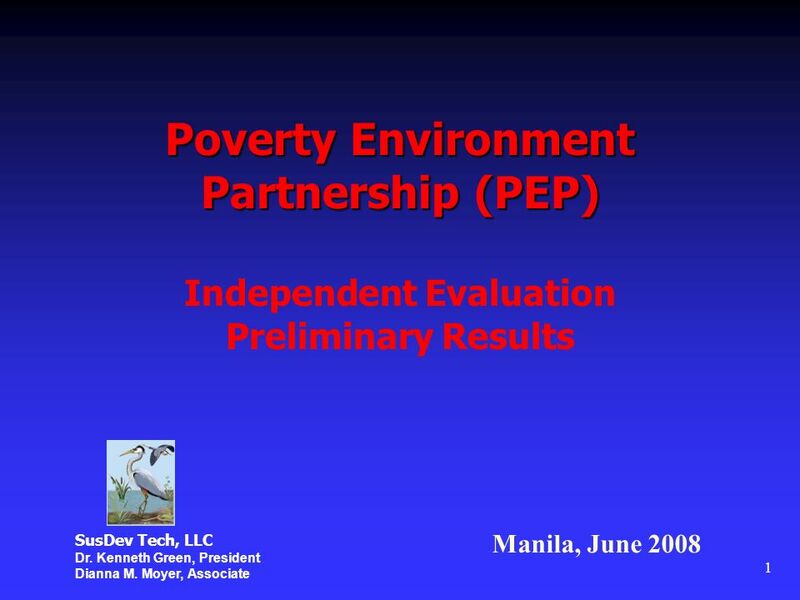 Download ppt "1 Poverty Environment Partnership (PEP) Independent Evaluation Preliminary Results Manila, June 2008 SusDev Tech, LLC Dr. Kenneth Green, President Dianna." Child Rights Toolkit Comprehensive Toolkit To Address Children's Rights In Development & Humanitarian Cooperation And Government Programming. 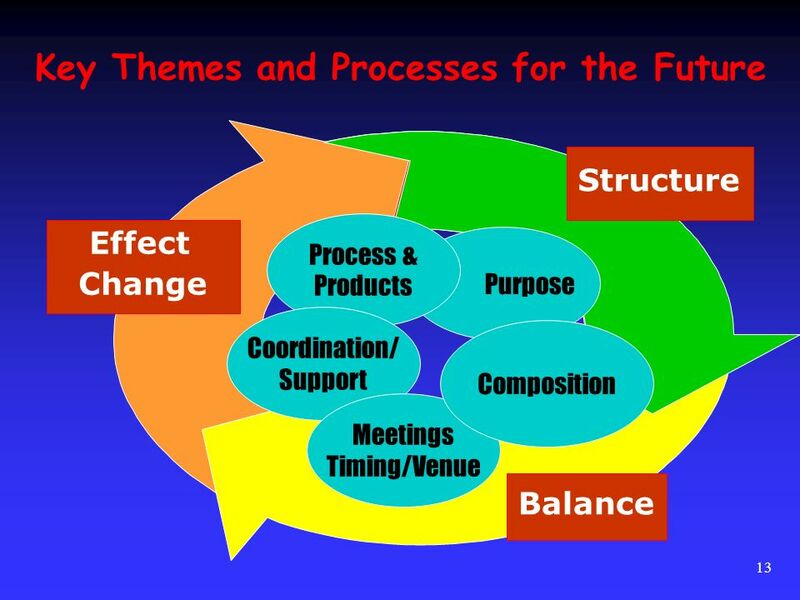 Consultation Process Towards the Post-2015 Framework on Disaster Risk Reduction Youcef Ait Chellouche UNISDR AFRICA. 1 Preliminary Consultative Meeting on Building a Global Network of NGOs for Community Resilience to Disasters, Geveva, October Global Platform for. 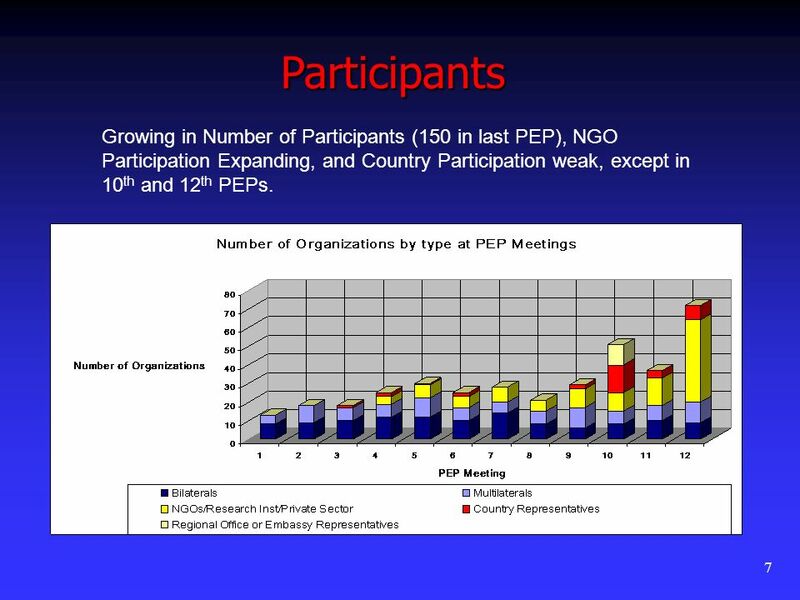 The Future of the PEP CIDA, GTZ & SIDA. 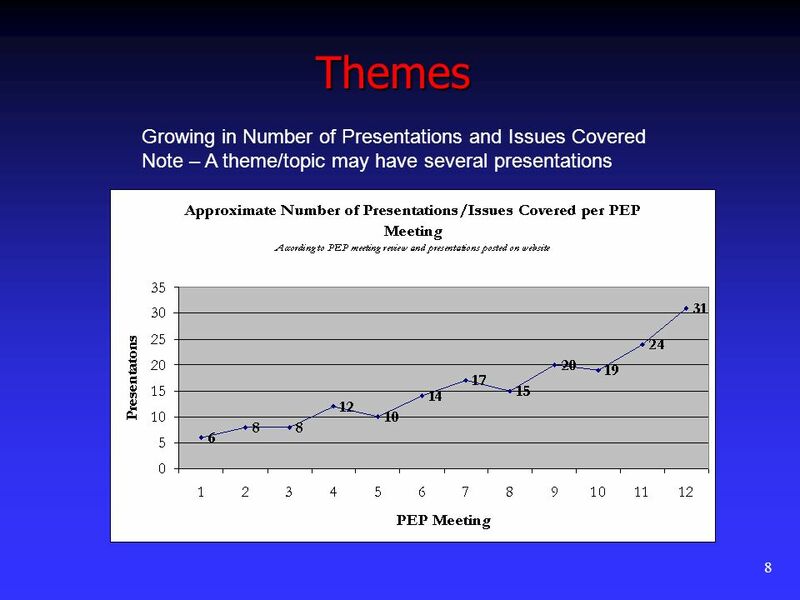 Background PEP 1 London 2001 Knowledge management and exchange of experience on mainstreaming Conceptual and analytical. 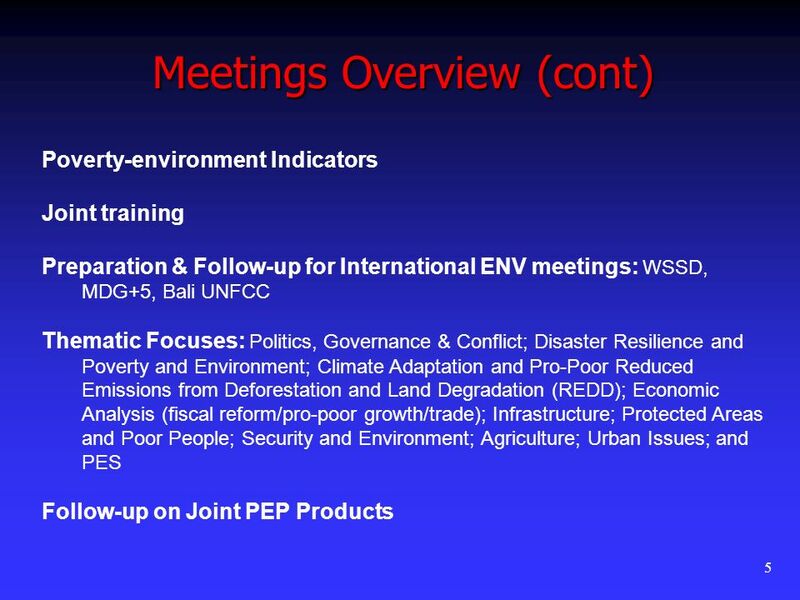 Scaling-up the UNDP-UNEP Poverty and Environment Initiative January 2007 environment for the MDGs. 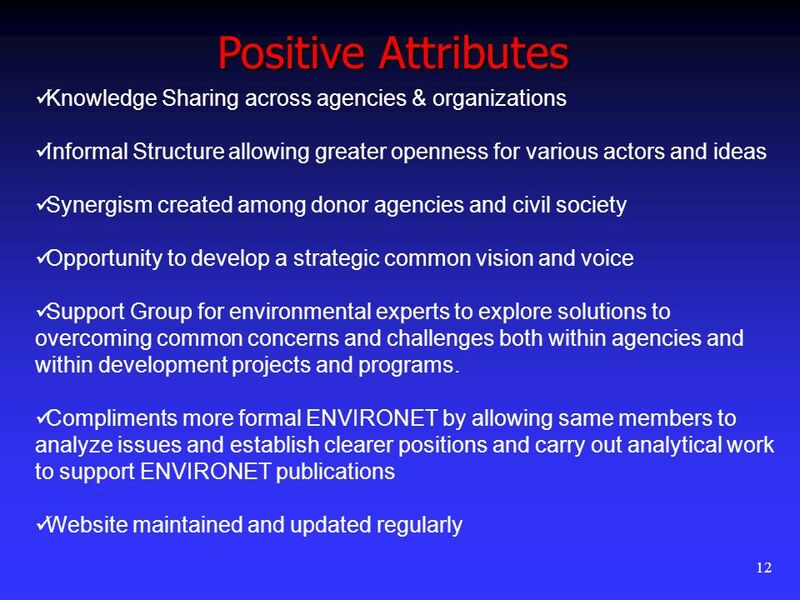 1 A Framework for Common Action around shared goals Presentation by Harald Lossack, GTZ on Behalf of OECD/DAC ENVIRONET PEP Meeting 15 June 2006. Mutual accountability and aid transparency Mutual accountability and aid transparency Republic of Moldova 1IATI meeting, OECD Conference center. Outcomes of the Africa Regional Preparations for Rio+20 Regional Commissions Side-Event Second Rio+20 Intersessional Meeting New York, USA, 15 December. MDGs Needs Assessment in Kenya Process, Experiences and Challenges George Anyango Ministry of Planning & National Development. Governance of Disaster Reduction Priorities and Organizational Arrangement for the Implementation of HFA Martin Owor Assistant Commissioner Head of Disaster. 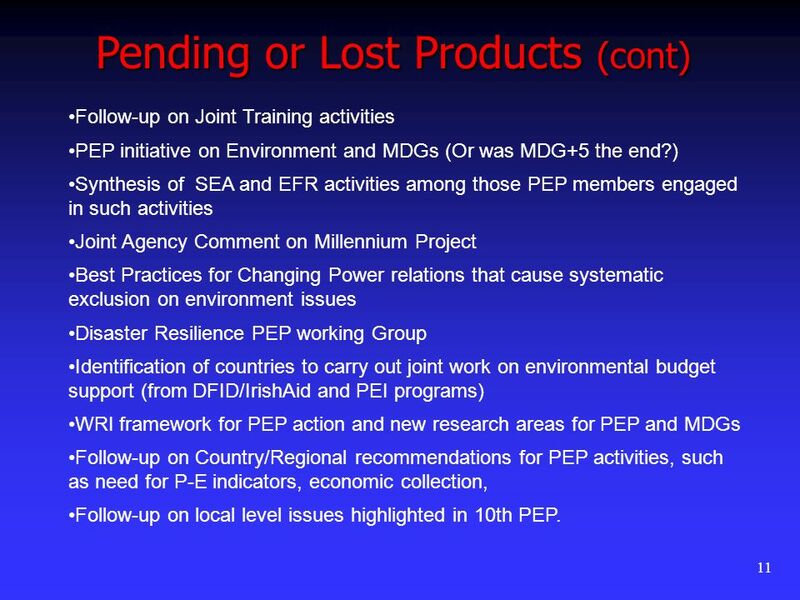 1 Agenda item 4: Work modalities of the revised ISDR system to support the implementation of Hyogo Framework- Elements to be reviewed in groups- & prepare. 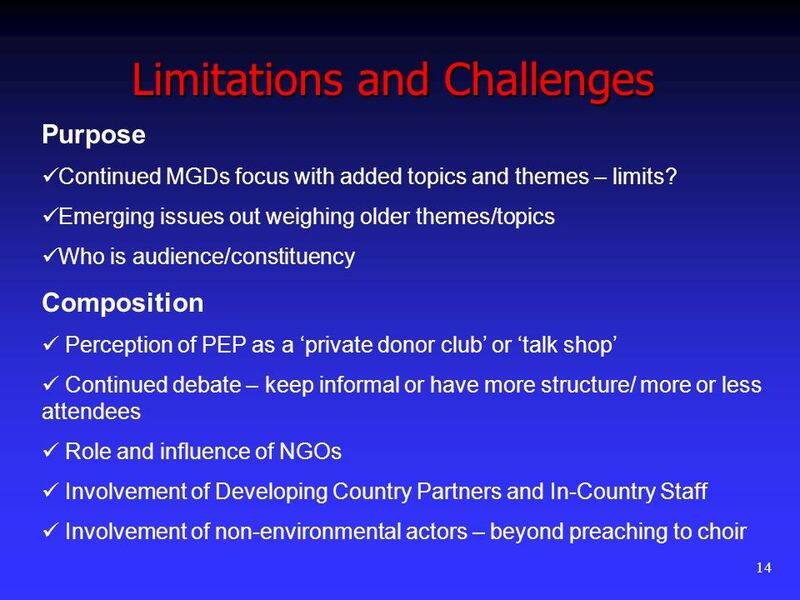 Politics and Processes of preparing National Plans and Budgets to achieve the MDGs Learning Event for members of the Policy Network on the MDGs July 19. 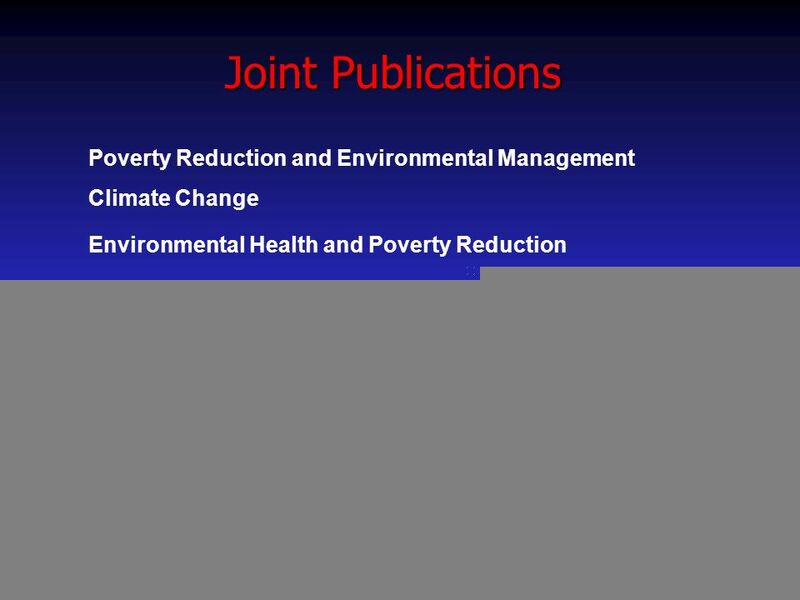 Poverty Reduction Strategies: A tool for implementing the BPOA Linda Van Gelder The World Bank. 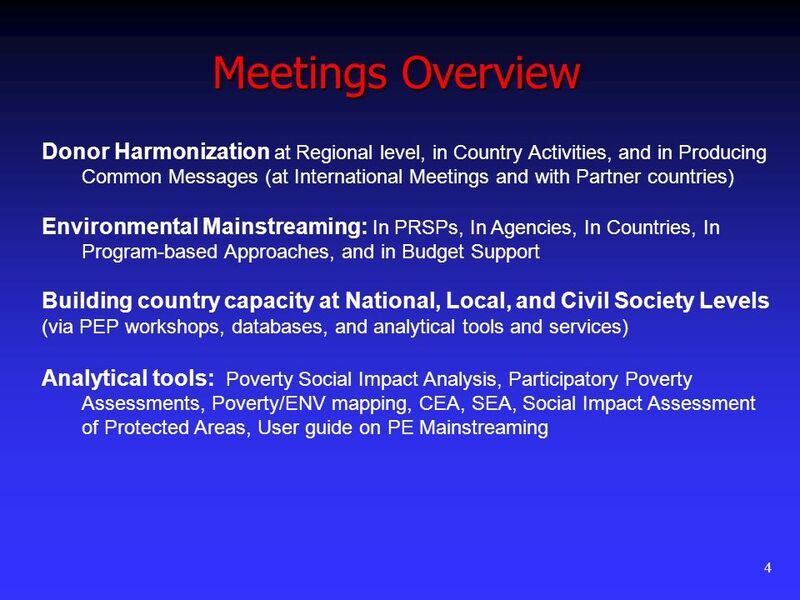 11 Scaling Up World Bank Group Engagement with Civil Society: A Strategic Priorities Paper Civil Society Team EXTIA. 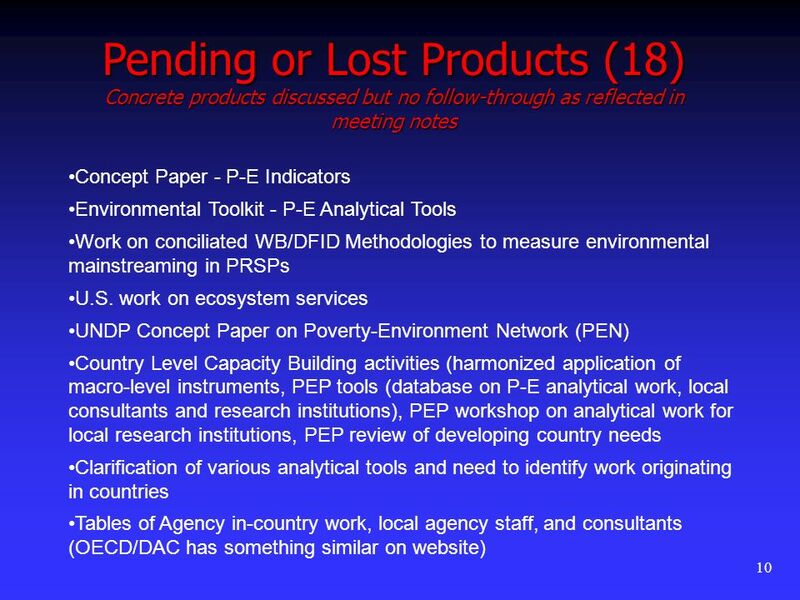 1 Poverty Environment Partnership (PEP) Steve Bass, IIED 13.12.05 www.povertyenvironment.net/pep.